Photo taken from website “Respectful Insolence.com. However, they do emphasize an important point about our culture: we can’t let people enjoy the things they like. I had an English teacher in middle school who had nothing better to do than ridicule his students’ reading choices. He snickered at my reading Robert E. Howard’s Conan novels, despite the fact that I was reading for pleasure, which the vast majority of people don’t even do any more. How did he react when I instead read Dostoyevsky’s Crime and Punishment for a book report? Not one word. Clearly, he just needed to feel superior to someone to make his day brighter. We all spend too much time making fun of someone else’s hobby. I’m just as guilty of that as anyone. But the fact is, life is hard: the horrors of daily life, given greater emphasis than ever to sell everything from news to security systems to political agendas, eats away at our souls. We need things to help us relax and recharge, to find common interest with other human beings and share experiences and emotions — even if only briefly. Making connections with other humans enriches our lives, and the more diverse those connections, the richer the life experience. 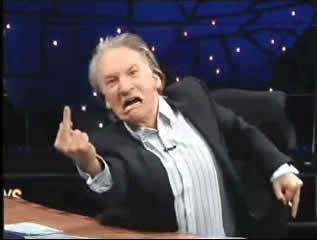 Bill Maher has made a living for decades sneering at others; it’s high time we stopped rewarding behavior like that and started finding our own joy in the things we do rather than criticize others for the things that make them happy. Well said. I was told by my Creative Writing professor that I write “supermarket fiction”. It nearly destroyed me back then. Now? I embrace that identity. Heck yeah, I write supermarket fiction. It entertains folks and gives them a place to escape to, which is more needed now than ever. Rock on, Bill! Thanks! And you keep rockin’ it too, you supermarket fiction writer!